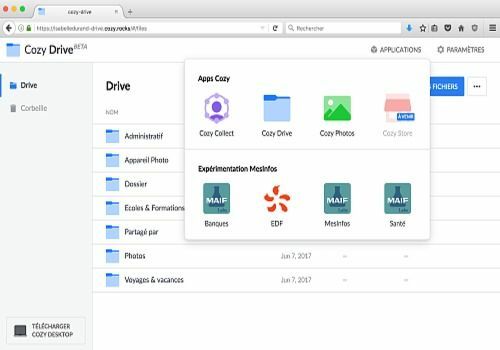 Cozy Cloud is a 100% French storage solution that allows you to recover data or third-party service files so that you have all your important papers at your fingertips. Cozy Drive allows you to store all your data and files. You can define which file types should be automatically synchronized in your drive. Photos that transfers your photos and stores them in the drive. Cozy Collect automatically recovers your data from your various accounts. This application takes into account your bank account and those of the health insurance and your mutual insurance company. Cozy Banks is directly linked to your bank account and sorts your bank details. This way, you have a good visibility of your expenses and the money you still have available. Each expense is categorized and you immediately find the invoice that is assimilated. Cozy Cloud is powerful and very secure software, you must identify yourself every time. It is a convenient file management tool that allows you to centralize all the information and paper you need. This tool is free up to 5GB, subscription offers allowing for more storage capacity are available.